Knowing your competition very well can inform and inspire you to do things differently to gain a competitive advantage. For example, teachers and trades people are on holiday’s over Christmas and not all go away. 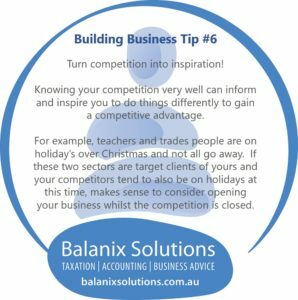 If these two sectors are target clients of yours and your competitors tend to also be on holidays at this time, makes sense to consider opening your business whilst the competition is closed.